How do you begin living a minimalist lifestyle? Each day a minimalist lifestyle is getting more and more popular. So, what exactly does being a minimalist means? Well, from my perspective, I would define a minimalist as someone who is not obsessing over material possessions. A person who enjoys what she/he owns and definitely isn’t done with buying new things, but would rather choose a nice family lunch at home than a shopping day right after a paycheck arrives. A minimalist is someone who doesn’t necessarily owns only the essentials to live but finds value in each thing that is surrounding her/him. So how to become a minimalist and start a minimalist lifestyle? Perhaps you’ve heard of Marie Kondo, and you’re ready to tidy up? 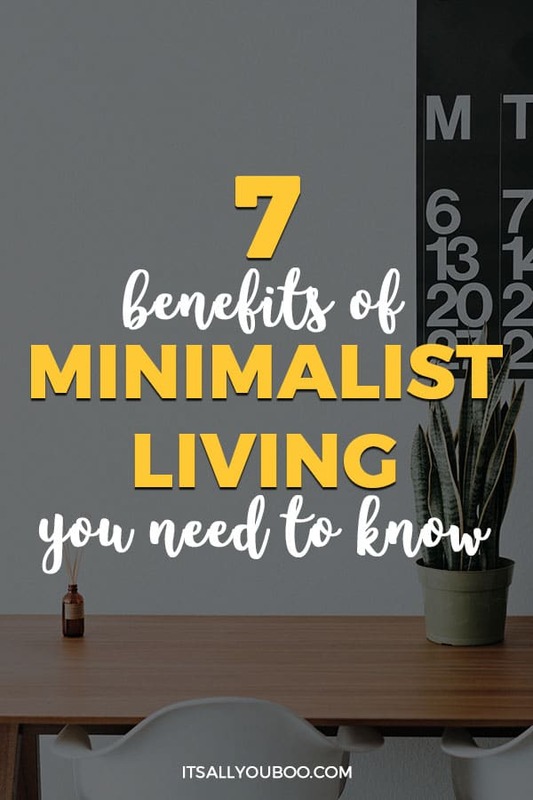 Here are 7 minimalist living tips to help you start living with less, and embracing the simple pleasures. The less you own, the less you have to stress about. You don’t have to spend much time thinking about what to wear, which plates to use when the guests come over and so on, and so on. If the last time you said: ”I have a closet full of clothes, but nothing to wear ” was not really a long time ago, consider this a wake up call. It’s time for some changes. You could at least get one message with that money. I mean, one massage a month for the rest of your life. Or you could go somewhere on a road trip with your friends. The point is, when you embrace a minimalist lifestyle, you consciously put an end to mindless purchases of things you don’t need and don’t really want. One of the most common ways to waste your time is by online shopping. I remember when I was working as a receptionist in a hotel and the manager of the reception told me and my colleague to look up some cardigans online so that we can order them for autumn. It was the end of summer and not many guests were in a hotel at the time so my colleague and I spent a good portion of our 8-hour shift browsing. Not looking at cardigans, of course. We did find some good ones, but after that, there were just so many other categories on the online store websites and you just have to see everything the store has to offer, right? 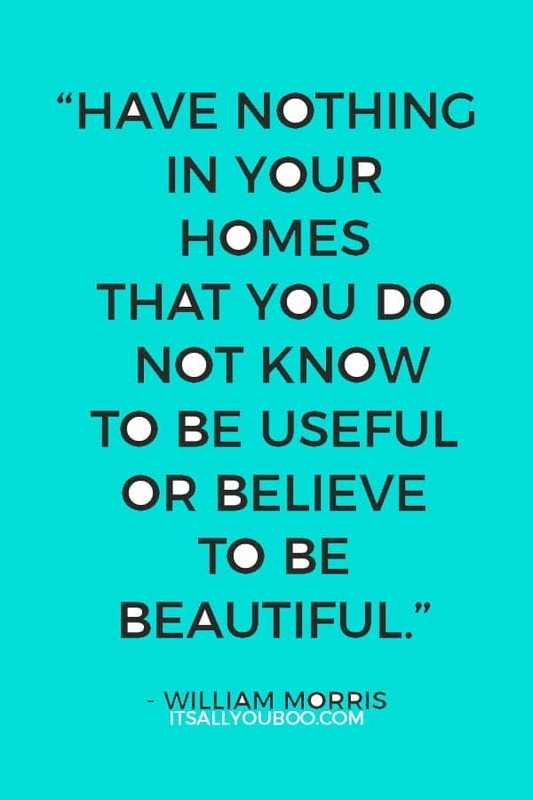 Also consider the amount of time spent on cleaning, perpetual organizing, washing, oh and decorating. One of the many perks of a minimalist lifestyle is the fact that you don’t own that much to be cleaning that much. As a part of my night routine, I spend 20 minutes daily to clean (dishwasher, cleaning the cupboards, etc.) and additionally 30 – 40 minutes throughout the week for vacuuming, laundry and all the other stuff that I don’t have to do daily. So yes, no more spending days and days to get the whole apartment clean and organized. When you start the decluttering process and when you see all the items you own, you’ll have to ask yourself certain questions to realize what really matters. You’re going to ask yourself: ‘‘Does this item bring me any value?’‘ (among other questions) so that you know what to keep and what is just not serving you anymore. Minimalist lifestyle includes everything that surrounds you, people as well. You’re going to find yourself thinking about people in your life and letting go of the ones that are not making you feel good anymore. And that’s okay. By removing whatever doesn’t bring you value, you start valuing yourself more. You realize that you are much more than the things you own. Plus, you realize that you don’t have to settle for fake friendships, and you start to appreciate the positive in life so much more. You start to appreciate yourself so much more. When you start your minimalist lifestyle and start your decluttering journey, you will eventually come across the sentimental items. What to keep and what to let go of? Let go of the things that aren’t making you feel good and that are not bringing you positive memories. For me, getting rid of sentimental items wasn’t a big deal, I got rid of pretty much everything. As I was giving the old photo albums to my mother because she wanted to keep them, she asked me:”These are family photos, why don’t you want them anymore?” So… How to explain to your mother that you don’t care about your old family photos? I told her that I haven’t gone through those albums for more than a decade and I really don’t see any value in those pictures anymore. Yes, I did enjoy times when those moments were captured and I did have a nice childhood, but past is not something I want to focus on. I try my best to enjoy the present moment, and I’m looking forward to the future, but past… Let it go. Just the other day I told my friend that I got rid of some guitar picks and drumsticks I caught on various concerts of popular bands and she asked me: ”What? Why?” and I told her that it’s because I don’t play any instrument, nor do I plan to, and she said: ”Yes, but you could keep it just as a memory.” I remember those concerts, I had the best time, but I just don’t see any value in keeping things under my bed just as a physical memory. From my perspective, it’s just additional clutter. 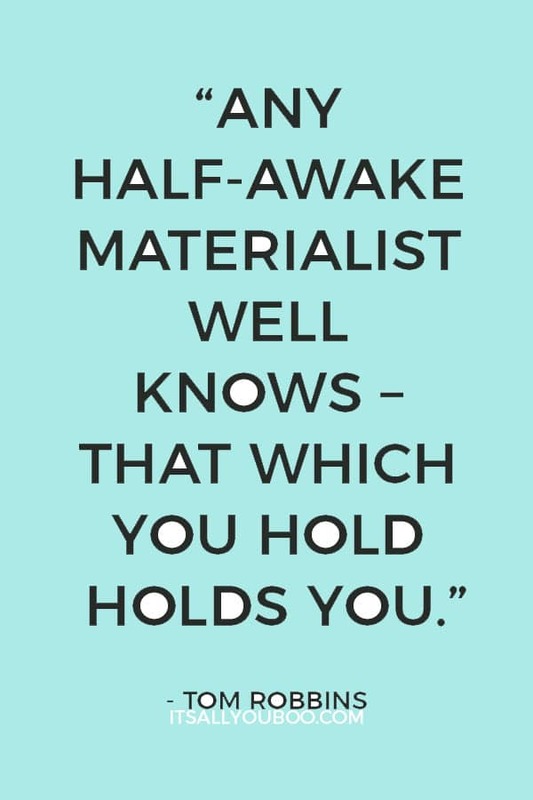 And minimalism lifestyle is all about bringing value into your life, so if you don’t enjoy certain material possessions anymore, don’t be afraid to let go of the attachment to them. This one may be the hardest, but you learn about it more and more as a part of a minimalist lifestyle. To let go of the ego means to let go of the need to add things into your life in order to make yourself feel better. Things are not going to make you feel better permanently. When we feel bad, the easiest thing to do to cheer us up is to eat some pizza or a cake (after which we again feel bad) or go out and buy ourselves some new shirt/new perfume/bottle of wine/you name it… But what happens a few hours later? Again, we feel bad. Do you recognize the pattern and how obvious it is that material things are never the answer to your emotions? We constantly feed our ego. 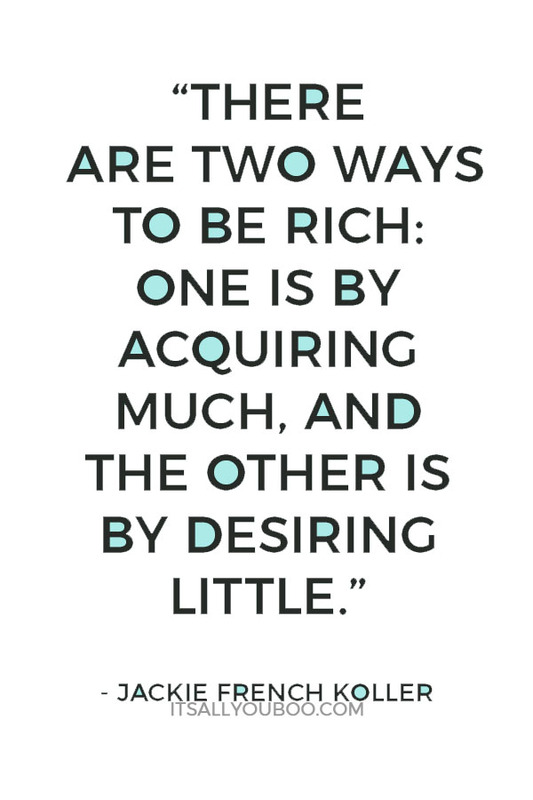 We feed it by buying things impulsively, by constantly thinking that we need more, by thinking that it is never enough. That we are not good enough. It’s all connected. When I started with a minimalist lifestyle, I started appreciating what I already owned and I started this new habit since I already decluttered and realized that I don’t need to buy new stuff nor some unhealthy food, I changed my behavior when I was feeling bad. So now when I feel bad, I try to find some permanent solutions. I ask myself why do I feel bad and try to find an answer within rather than focusing on the problem and looking outside for a temporary solution. A minimalist lifestyle is all about simplifying your life and living more mindfully. You don’t have to get rid of all your possessions, just make sure that whatever you own and everything and everyone you surround yourself with, is bringing you feelings of joy and happiness. The simple truth is, you don’t deserve anything less than that. You deserve to experience your best life. At the end of the day, we all want to be happy, we just have different ways of accomplishing that. I’d suggest trying out ”30 days to simplify your life” challenge by MuchelleB. It’s a great start to your minimalism lifestyle journey and it covers various areas of your life, such as finances, social media, personal style, and all the other fun stuff. Another source I’d recommend is a book by Marie Kondo ”The Life-Changing Magic of Tidying Up: The Japanese Art of Decluttering and Organizing”, and you can find it here. It’s a step-by-step guide for simplifying and decluttering. To conclude, minimalism is a journey. You will learn a lot about yourself and start finding beauty in simplicity. From what I see and experience myself, we are often too hard on ourselves and tend to push ourselves to constantly do something. The perpetual to-do lists, constant focus on lack instead of focusing on finding gratitude in what we have and are… We get lost sometimes. And that’s okay. We sometimes lose our direction between going after what we want to have on the one side vs. what we want to feel, on the other side. I encourage you to find what feels good. Minimalist lifestyle will help you to free your environment and your mind from clutter and open yourself to the new perspective. 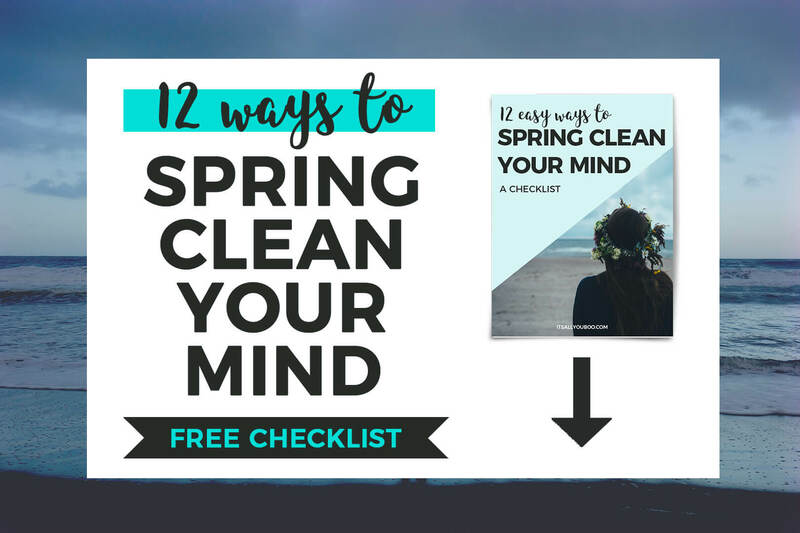 Begin your journey to minimalist by decluttering your mind with the FREE Printable Spring Clean Your Mind Checklist. Next time your friend suggests spending a day shopping, you can try suggesting going out to lunch and catching up with them by sharing some amazing food and just listening to each other. I mean, really listen. Sure, you can take a picture of food for your Instagram, but after that put your phone on silent in your bag and just enjoy your time together. Stop mindlessly rushing through life, be present. 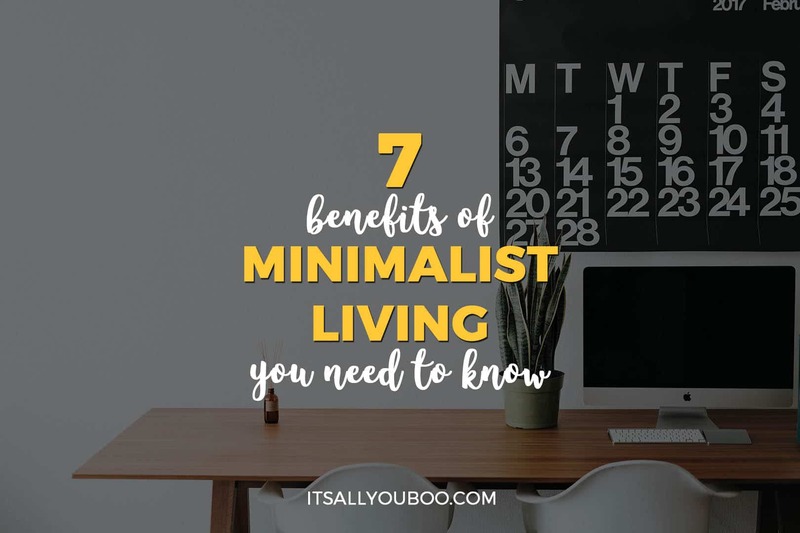 Are you ready to start minimalist living? 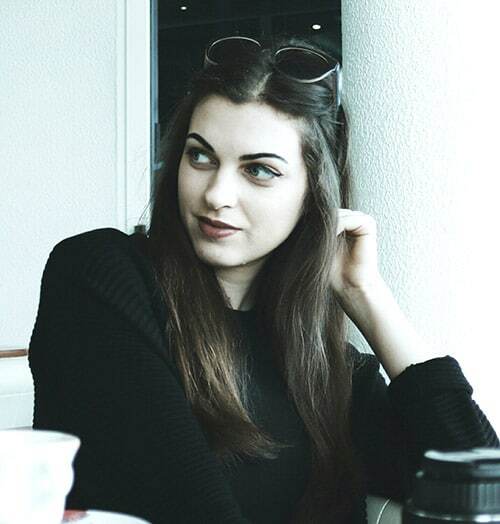 Ivana Skorić is a personal development and Law of Attraction blogger from Croatia. She enjoys sharing what she’s learned through the years of her own self-discovery journey with others on her blog, la ivana. When I think of the word minimalism, I think about my former neighbor who sold everything she had in terms of furniture etc. She’s like me in that she doesn’t like being in one place for too long. By selling everything, she was able to move recently and everything she owned fit in the backseat of her car. It was liberating for me to see that and I was a bit envious as well because I, too, am happier traveling from place to place without having to think about paying $5000 to move out of state. I’m starting to embrace this idea actually, so I love this post! This is such a cool post! So hard to be a minimalist as a fashion and beauty blogger but I always strive to be! Stressing less is high on priority list. It’s much needed for a happy life. I have a friend that tries to live a minimalist lifestyle and she really enjoys it. She has really condensed her life and you’re right — she says it gives her much more peace of mind and does help with her finances. I and just reading The Life Changing Magic of Tidying Up by Marie Kondo. I so want to make a lot of these changes and have less stuff, less clutter and more financial control! I’m happy to have found your blog! So much great info! Thank you! This is SO true. We feel so much better when we have less clutter around. I’ve been meaning to do a huge clean up for a while now!! Really need to put it at the top of my list! I always try but end up hoarding a lot more than required. My advice is, ask yourself why does that always happen, realize what the reason behind it is and then start making some new decisions to make sure it doesn’t happen again. From my experience – things will always repeat until you learn the lesson from it. This is all so true, especially about the mind. When you let go of the past and your ego, you are truly living minimally, with less baggage and clutter. It feels so good to live that way. Great tips! Thank you! I love these tips. Minimalist living is great. Thanks for sharing. Love this in depth post about being a minimalist. I am an aspiring minimalist – always releasing, cleaning, keeping it simple, both in mind and in lifestyle. Thanks for this – its wonderful! Beautiful post. I definitely agree Less clutter means less stress. I gotta de-clutter my house, my mind, and my life. Also, letting go of Ego is another big thing….If only we all could do so. Have fun with your decluttering process! I definitely have too much stuff! For me, the hardest part is letting go of those sentimental items. Right there with you! But I ask, why do I NEED to keep this? Letting go can be hard. I’ve definitely been trying to lead a more minimalist lifestyle, but my gosh it’s challenging! You bring up some great points about sentimentality and ego here I honestly never even thought of. Kind of inspired to go clean out my closet now! (Hey, it’s a step right? It’s a great first step, I find that when I’ve cleaned out my closet, all of a sudden I’m inspired to get everywhere else as tidy. And as minimalist. You and me both! That’s exactly what I want, I feel like I don’t need 90% of what I own anyway. It’s the simple, the minimalist life for me. I’ve become somewhat of a minimalist in recent years. Not so much on purpose to say I’m a minimalist – just realized my life was very cluttered. I just got tired of seeing piles of stuff we didn’t use piled up in the closet or storerooms. I’m more intentional these days with anything I purchase and decided if it is simply a want or something that I’ll actually use. Oh my I know that feeling all too well. Like there’s just too much stuff and it’s closing in on you. I wouldn’t say I’m a full-on minimalist either, just that I like to have less and like you very careful with new purchases. Must be something I will actually use and love. If not, what’s the point right? I loved this post it is very inspiring to me. I think I would get tripped up on the sentimental items the most. Since both my parents have passed the sentimental pieces are all I have left, so it takes on a different perspective at that point. When you can no longer enjoy your time with that person, those items and memories are all your have left. So glad you enjoyed it! Sentimental items are such heart string pullers, aren’t they? Like I couldn’t possibly let this go. But, I so know the feeling, after my grandmother passed I couldn’t let go of anything, although at the same time I was overwhelmed by how when you die you leave so much. So, partly vowing to never leave a lot behind, but also as time passes I can let go of more. I realize that the true sentiment are my memories. These tips are fab. I’m defs gonna try them. Minimalist is one of thing that I wanted to be. because this is the only way that everything should be organize very nice post! You should give it a try! Just start with something small, like your wardrobe. And go from there!